An oscilloscope is a device that is used to measure time based varying signals and also to calibrate equipments to bring their standard value. Certain faults in electronic circuits can be identified and corrected with the help of oscilloscopes. Nowadays, many types of oscilloscopes are available in the market today. Since each type has different pros as well as cons, buying the right one depends on the type of circuit to be tested, or the equipment to be calibrated. There are mainly 2 types of oscilloscopes, analog and digital. Apart from some minor differences, both serve the same purpose. The selection criteria mainly depends on the different parameters these devices carry. 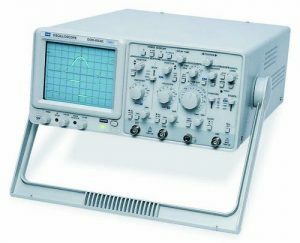 When it comes to oscilloscopes, another word that people usually have heard along with it is the CRO or Cathode Ray Oscilloscope. The CRO is just an old name for the analog oscilloscope, which has been serving its purpose for almost 100 years. Since its invention, the analogue oscilloscope took many forms, ending up with the digital oscilloscope technology that is mostly used nowadays. Since the CRO is the first technology used, it has been named the analog oscilloscope. An analog oscilloscope or CRO uses Cathode Ray Tube (CRT) technology to measure and study the waveshapes of a repetitive electronic signal. Other parameters like voltage, current, power and frequency can also be measured width the help of a CRO. The only one criteria is that the quantity provided must comprise of an amplitude and a waveform. e analog oscilloscope helps us to see the amplitude of electrical signals as a function of time on the screen. When the signal is given as input, it is used to deflect an electron beam vertically and horizontally. The person gets to view the relative output simultaneously on the screen and thus identify the signalâ€™s shape. Knowing more about the signal gives the user a better idea on the problems with the electronic circuit being checked, and thus make the necessary changes. To get a better idea of the CRO, it is necessary to know the working of the different parts of it like the trigger circuit, horizontal amplifier, vertical amplifier, time base generator, deflection plates and so on. We have explained this in detail in our previous post – CRO – Cathode Ray Oscilloscope. The different parameters that define the CRO are explained below. All of these functions are also available in digital oscilloscopes. The bandwidth of a wave is the measuring parameter used to define the frequency at which the measured amplitude of a particular sine wave has a certain decibel value lower or higher than the actual wave amplitude. Bandwidth will be the difference between the highest and lowest frequency roll-offs, where the response has fallen by -3 decibels. This specifies that the bandwidth of a wave is independent of time, but only depends on the frequency of the wave. 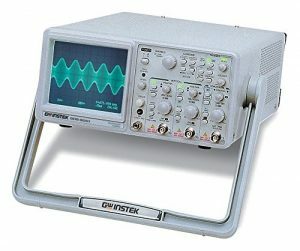 Other parameters of the oscilloscope are all time dependent. 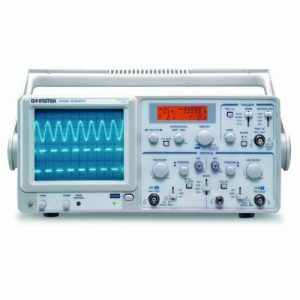 Oscilloscopes that are available in the market today also respond to DC (0 Hertz) and thus are said to be DC coupled. The bandwidth in such a case is the highest frequency of operation. Speed wise, the slowest analog oscilloscope available in the market today has a frequency of 10 MHertz. There are oscilloscopes with 20, 30, 40, 50, 70 and 100 MHertz. As the number of channels increase, the number of waveforms to be displayed on the screen can also be increased. Most oscilloscopes in use today are dual-channel models. Before you purchase an oscilloscope make sure if it is a 2 or 4 channels. Single-channel oscilloscopes can display one waveform at once, dual-channel oscilloscopes can display two waveforms at once and 4-channels oscilloscopes can display four waveforms at once. When buying an analog oscilloscope always look out for the sampling rate of the device. The better the sampling rate, the more accurate will be the smaller details in a fast signal. A faster sampling rate also means that the signal has more resolution, thus eliminating the possibility of losing even the minute details in the signal. By definition â€œSample rate can be explained as the rate at which the input signal from the circuit converted to its digital representation. SR = 1/50 = 20×10^6 samples per second. All CROâ€™s of different bandwidth have the capability to measure and display different parameters of the waveform like phase shift, rise time, fall time, delay, pulse width, duty cycle, frequency and period. All these parameters are clearly explained below. The display of these measurements on a CRO is shown below. All analog oscilloscopes has this feature where you can trigger and display periodic and nonperiodic signals for comparison with the circuit output. The signals include single pulses, sine waves, square waves and so on. These triggers can be delayed with a predefined time interval to compare with the output signal. All analog oscilloscopes display the triggered signal after giving the trigger. This mode is used to compare the channel output signal amplitude. This feature comes in handy while measuring the phase difference. Maximum Time Base is used to raise the time for the corresponding value on the Y-axis. The time varies from nanoseconds to microseconds. Providing a maximum time base will help in obtaining the most precise results. Since this parameter defines the longest time between signals, you can get a clear picture of the waveform. Minimum Time Base, being the opposite of the maximum time base is used to lower the time for the corresponding value on the Y-axis. Maximum Vertical Sensitivity is used to see the maximum limit as to how much the CRO can boost a weak signal. The maximum value is always measured in millivolts and will have different values according to the change in oscilloscope. Minimum Vertical Sensitivity always has a value of 2 millivolts per vertical screen division. It rarely varies for certain oscilloscopes. Rise Time value, in most cases is the same as the value of your device bandwidth. The useful frequency range is observed as the rise time of the device. The device becomes more accurate if the rise time is faster. Some of the best analog oscilloscopes will be reviewed according to their bandwidth variants. 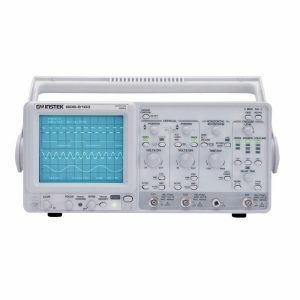 The GW Instek GOS-620FG Analog Oscilloscope by GW Instek has a built-in function generator, which is clearly worth its price. The unit has a total dimension of 150 mm (height) x 310 mm (width) x 455 mm (depth). The device is also equipped with ALT triggering function and modern features like Z-axis input, TV synchronization capability and channel 1 output for electronic applications. The device can generate sine, square and triangle waveforms in 7 different frequency ranges between 0.1 Hertz and 1 MegaHz and a sine wave distortion as low as 2%. The device has a high sensitivity of 1mV/div. The additional products that comes with the device include a power cord, a user instruction manual,a 200 MegaHz GTP-020A-4 passive probe per channel (1:1, 10:1 Switchable). 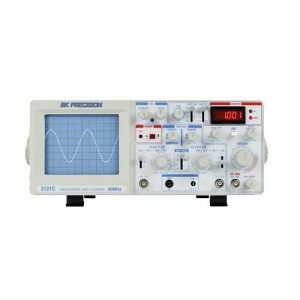 The extra function generator comes real handy for both students and in production lines. Auto/Normal Trigger, ALT trigger, TV trigger, X-Y mode, Z-axis input. 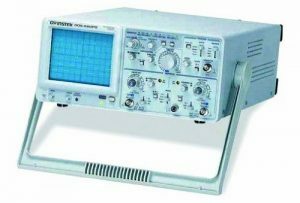 The GW Instek GOS-620 Analog Oscilloscope by GW Instek is the perfect device for electronics based applications like servicing, repairing, production and assembly lines. The CRO is also apt for use in engineering college labs and for projects. It has an overall height of 150mm, width of 310mm and a depth of 455mm. The waveforms can be viewed through an internal 8×10 division grid (1 grid = 1 cm). A power cord, 2 probes and an instruction manual is received with the CO. The green monochrome screens and old style controls may make it look a little out of date. But when comparing its price with other brands of the same specification, this CRO is worth buying. The X-Y mode has a sensitivity of 5mV – 5V/div (4% error). Trigger modes include AUTO, NORM, TV-V, TV-H. Trigger sources are CH1, CH2, ALT, LINE, EXT. The 30 Mhz bandwidth GOS-630FC model by GW Instek has a 1 mV/div high vertical sensitivity and and has trigger modes in TV-V and TV-H. The additional feature of this device is the 5 digit real time frequency counter, which is very helpful during measurement takeouts. The pane displays from a range of 50 Hz to 30 MHz. This display also has a backlight as a backup for low lighting. The CRO has an overall dimension of 150 mm height x 455 mm depth x310 mm width. A buzzer alarm is also installed to warn the user during incorrect operations. The display intensity can be controlled using the z-axis input feature on the rear panel. The sweep time can be automatically adjusted using the AUTO Timebase key. Two GTP-060A-4: 60MHz (10:1/1:1) Switchable passive probes, a user manual, and a power cord comes along with the CRO. Some reviews on Amazon suggest that this model has a very good build quality and and is very economic for such a low price. The only problems the users faced was the insufficient brightness in seeing a magnified waveform. The 2121C model analog oscilloscope by B&K Precision is dual trace and offers high performance at a small expense. Both dual and single trace operations can be carried out with this device. Another feature is the calibrated 23 step time base with a X10 magnifier. The device is also equipped with an alternate/chop sweep and video sync trigger. This model has a 50 MHz frequency counter. The device has a display resolution with auto select option ranging from 0.001 Hz to 1 KHz, depending on the frequency. An additional 5 digit red LED display 0.36â€ screen is used to show frequency at Hz and KHz range. 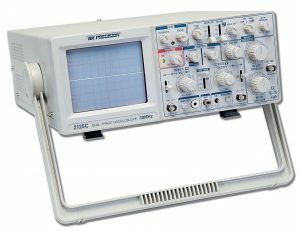 Reviews suggest that this CRO is the best entry level oscilloscope which i heavily built and precise. The device is undoubtedly reliable, durable and value priced. The 2125C model dual trace oscillator by B&K Precision has an in-built component tester option that no other model has. Testing of components like resistors, capacitors, inductors and semiconductors can be performed. Â Sweep system has three operation modes: The main, mix and delay. The delayed sweep speed range is from 0.1 microseconds to 0.1 seconds per division, in sequence of 1-2-5. Fully adjustable sweep times are provided between steps with the help of 23 steps of Vernier control. The sensitivity specification is 5mV/div to 5V/div and 1mV/div to 1V/div at x5. The GOS-653G model by GW Instek is known for its abundant and useful features like delayed sweep, built-in delay line, TV synchronization abilities, ALT triggering, Z-axis modulation input, channel 1 output, trigger level lock function, and hold off function. The vertical sensitivity ranges from 1 mV to 5 V. In X-Y operation, the X-axis bandwidth for DC is approximately 2 MHz. The horizontal system has a main sweep time of 0.1 second to 0.5 seconds per division with an error of 3% and a x10 magnitude range of 100 nanoseconds to 50 seconds per division for an error of 5%. For this model, the delayed sweep time comes up to 0.1 second to 0.5 seconds per division with an error of 3% and a x10 magnitude range of 100 nanoseconds to 50 seconds per division for an error of 5%.The delay time jitter is better than 1:10000. The GOS-6051 model by Instek has many attractive features like CRT readout, cursor measurement, and the ALT MAG function. The additional use of a 6 digit frequency counter function also makes the device useful for testing and analysis purpose. There is a buzzer alarm and LED indicators provided for warning the user for bad corrections and to notify other operations. The ALT MAG function helps the user to magnify signals 5 times, 10 times and 20 times. The CRT cursor readout for amplitude and frequency measurement is very helpful. A save and recall front panel setting is provided to save waveforms or trace. Their numerical values can be used later for comparison with other waveforms. It copies the data, as opposed to the graphical image on the screen. The product is light in weight and sma in dimension which makes it easily portable. The 2160C model CRO has the same specifications as that of the 2125C model explained above. The only difference is in the bandwidth. While the former has a bandwidth of 30 MHz, this model has a bandwidth of 60 MHz. The CRT type (Rectangular with internal graticule) and display area are the same. The area cover a total of 8×10 divisions (1 division = 1 cm). A component testing mode is available. The unit comes with additional items like AC power cord, user’s manual, 2 probes (PR 33A x1/x10), and a spare fuse. The total dimension of the CRO is 180x370x440 mm. Trigger modes include AUTO, NORM, TV-V, TV-H. Trigger sources are CH1, CH2, ALT, LINE, EXT. Built-In 6 digits Universal Counter, 10 Sets Memory for Front Panel Setting Save and Recall, Cursor Readout with 7 Measurements.